Have you gotten your free copy of the Harmony Coloring book yet? It’s easy to get one. Simply sign up for my email list and I’ll send you the link to download your free copy. There are other surprises too! You can sign up here. I send out only one email per week to let you know about new posts and other news. I invite you to share your colored-in pages. Do you have pictures to share? Take a photo with your phone and send it to me. I’d love to share. Reading, to organize my thoughts. Praying, to tap into my soul, drawing me closer to God. Time spent outdoors, especially in the Spring, to quiet myself. The landscape is slowly coming to life here in New England and when I see signs of Spring, I think of Henry David Thoreau. His intimate knowledge of the outdoors came from a sense of mindfulness–no detail missed his watchful eye. He took the time to be still and observe. And in following that simple maxim, the world revealed itself to him. I welcomed this book because while I have always appreciated Thoreau’s message, I find his his works difficult to get through. The writing is dense, demanding your full attention. Many of us suffered through high school and college English classes with his classic Walden. And yet, that message of a different way of living got through to me even though I could not begin to digest all the words. What I loved about Henry David Thoreau for Kids were the twenty-one activities geared for middle school students that help you live out his ideas. Many of these activities are just as engaging for adults. I was intrigued by the exercise which encouraged the participant to sit outdoors for thirty minutes in total silence, waiting for wildlife to appear. Sure enough, after a few moments birds and other creatures come close for observation. I was eager to try this exercise in my quest to be still. Stillness, however, does not come easily in this busy world so I was grateful that Smith recommended another exercise to help me focus–creating a sound map. Sitting in my lawn chair, I sketched the area you see here in my notebook and every time I heard a sound from nature, I drew an “x” where I thought I heard it and wrote down what it was. As you can see, I heard quite a bit! In the listening, I began to appreciate the visual imagery around me. 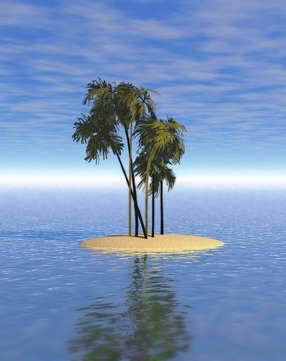 Stillness and mindfulness are hard to achieve in this high tech, multi-tasking, noisy world. Patience and due diligence are rewarded however with the opening of the inner eye, that which sees beauty and truth around us and eventually, within us. It’s a simple truth really: the wonder of life and how it was created, and how we are lucky to be alive despite all the challenges. Emerson experienced an epiphany that day–the discovery of the ability to read between the lines in the world around him, and come to an understanding of a deeper existence within him. … you never want it to close. All of a sudden, the smallest things become lovely, compelling, even exciting. Once I became mindful of what surrounded me in the natural world, I couldn’t get enough of it, especially when it came to bird watching and kayaking. And once I made a commitment to pay attention to what was there inside of me, allowing myself to to be drawn closer to my Creator, I find I can’t get enough of that either. Silence is becoming an elixir. I understand from the great mystics that you can learn to be quiet and still even in the midst of noise and chaos. Wouldn’t that be something! Somehow I think a bunch of people with that kind of inner harmony could truly change the world for the good. Think about it. Try spending thirty minutes in the woods, in a field or by a pond this Spring. Create your own sound map and share it here. Let’s compare notes and find out how we are doing on our journey to harmony. You can find out more about Henry David Thoreau for Kids here, and read about the author, Corinne Hosfeld Smith, here. Today I had the good fortune to catch a wonderful program on PBS called “Bird Tales.” You can watch it on your computer or check your local PBS station for a schedule of showings. Watch Bird Tales | Preview on PBS. See more from WENH. You will meet Donald Kroodsma, a songbird expert who has devoted his life to not only recording bird songs but interpreting what the birds are communicating through their songs. He chronicles how a young bird grows from a baby’s babble to the full song of the adult. He talks about birds who have migrated from other parts of the world and demonstrate that by the extra sounds they include in their songs that are native to the countries they migrated from. 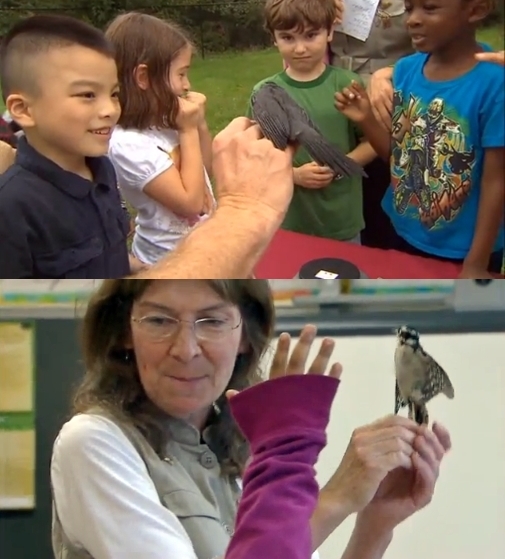 You will also meet a team of classroom teachers and instructors from the Smithsonian Institute in Washington, DC who expose school children to birds in their natural setting. They are shown where these birds migrate and follow up by connecting with school children in the migration-bound countries who see these same birds (through the process of bird banding). We are introduced to a young man of sixteen, Abraham Hunter, who has taught himself how to paint birds and landscapes strictly through perseverance and his keen powers of observation. 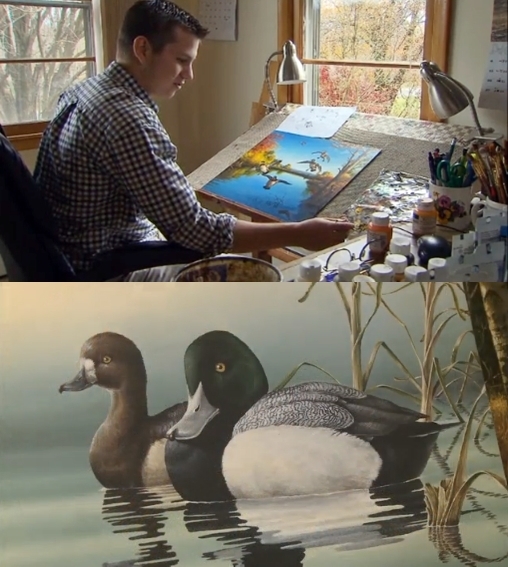 Some of his paintings were chosen to be reproduced as stamps to raise awareness about wildlife. There is much more to see in this wonderful program which you can view in its entirety online. I have included it here for your enjoyment. Have birds made an impact on your life? Share your bird stories with us! I loved this post that my husband sent me yesterday! It is written by author Anne Strieber, well known for her thrillers An Invisible Woman and Little Town Lies. She is married to Whitley Strieber, best known for his horror novels The Wolfen and The Hunger and for Communion, a non-fiction account of his perceived experiences with non-human entities. 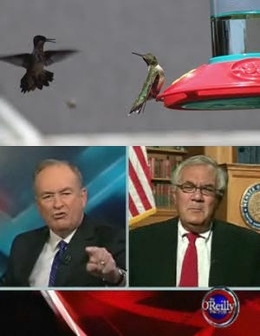 In this post, Anne draws an analogy between hummingbirds who love to pick a fight, and people of the same ilk. It proves yet again how much we can learn by drawing upon and make connections. He speaks of the need for human connectedness. Anne extends that connectedness to the entire natural world. ” … I’ll see a hummer [aka, hummingbird] land on our feeder, take a sip of sugar water, then immediately put his head up and look around, searching for a rival. I used to think this had something to do with guarding the food source, but now I’ve realized it’s because hummingbirds really ENJOY a good fight. Soon two (or three) hummers are buzzing around, darting at each other, feinting and threatening, sometimes even telling each other off with that little “cht, cht” sound they make. All the lessons we need to learn are out there. We just need the senses for perceive and a heart and head that will listen. Parrot Lovers – check this out! 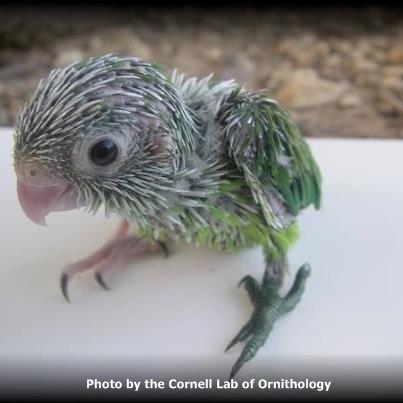 I found this on The Cornell Lab of Ornithology Facebook site. If you like parrots, you’ll love this! Kayaking is such a great way to sneak up on birds! Here’s a couple I was able to capture in a picture. The setting is Mill Pond in Westborough, MA. This place never disappoints!